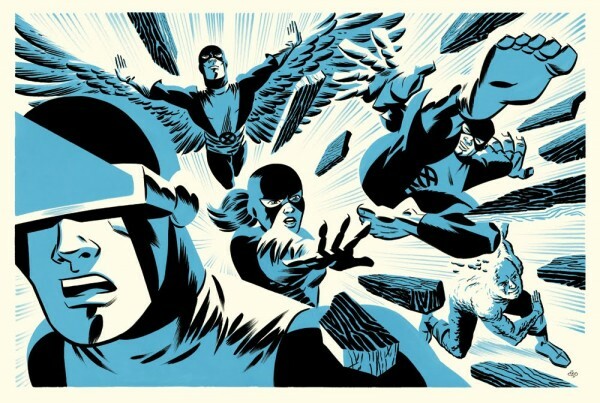 Even though he's been working in comics for years now, I knew of Michael Cho's work primarily as an illustrator, designer and maker of stand-alone superhero images. During a welcome, chance encounter at Emerald City Comicon, I learned Cho was making inroads into name-on-the-cover comics publishing. 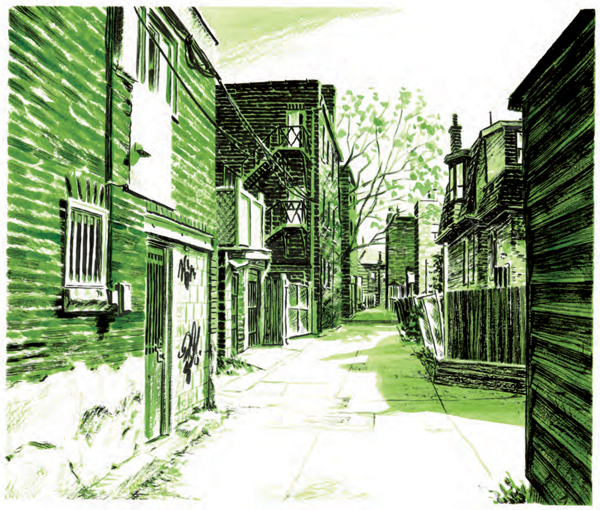 Back Alleys And Urban Landscapes isn't exactly the major graphic novel we'll eventually get from the Toronto-based artist; it's more of an art book with a bit of commentary, a series of portraits of spaces the vast majority of which are used by Toronto citizens to get from one place to another. 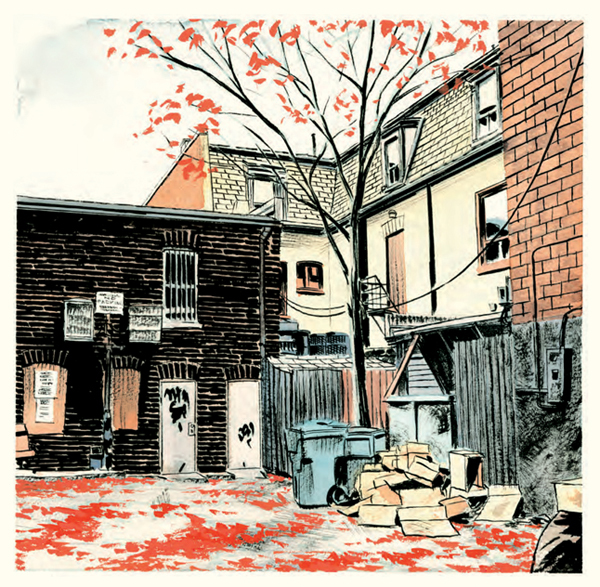 The art is lushly realized, and if we've learned one thing as comics readers in the last 20 years it's to accept works like the imminent Drawn and Quarterly effort as an experience in comics reading organized around something other than a narrative. TOM SPURGEON: So how did this project become a book? These are drawings that you were doing, and I'm guessing that's not how this project started, with a book in mind. MICHAEL CHO: Kind of, sort of. It became an intention of mine pretty quickly. The impetus for these drawings is different, I had completely different reasons for them. But within about doing five or six drawings... I always think in terms of series, right? If I have five of anything or more [laughs] I'm always thinking, "I could do something with this." Right? So immediately I thought, "This would be a great collection for a book." 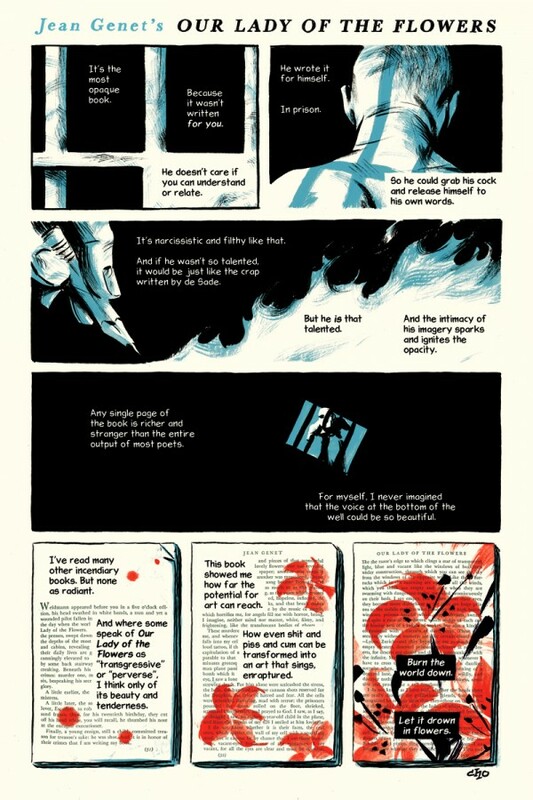 One of the inspirations for the drawings in the first place was a set of books. So I always had in the back of my mind that if I did enough of these drawing I would collect them and take them to a publisher and hopefully they would agree to put them out as a book. I never actually know what the enough-drawings amount was supposed to be, so I kept plugging away at it. [Drawn and Quarterly Publisher] Chris Oliveros and I were talking about another project we might do. He suggested along the way, "Hey, why don't we put out those drawings of yours in a book?" I said, "That's a great idea; I've been thinking the same type of thing." He was really gracious, because he basically said, "Fine. You know what you're doing. Just put it together." [laughs] That's always great. I asked, "Can I design the cover? Can I design the whole thing? I'll lay out the whole book." All he wanted to know is how many pages. He was very gracious about suggesting the format we could work in. He basically said take as long as I needed. [laughs] It's the ideal scenario, and I can't thank him enough for having the patience with me to allow this to happen. SPURGEON: What was the book that helped inspire the series? CHO: My wife has a family friend, and he used to collect books from the '50s. He was a very big comic strip fan. It was one of those things we had in common. 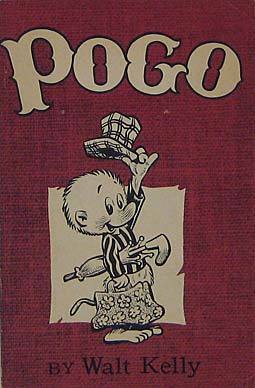 He had an amazing collection of Walt Kelly Pogo books. The entire set, right from the beginning. He even had the record. Have you ever seen that? CHO: He had that. He gave them to us for safekeeping, and he also gave us along the way a couple of other interesting books that were part of his collection. Among those interesting books were these two little books that were hardcover, little landscape books that were put out I think it was the '30 and the '20s. 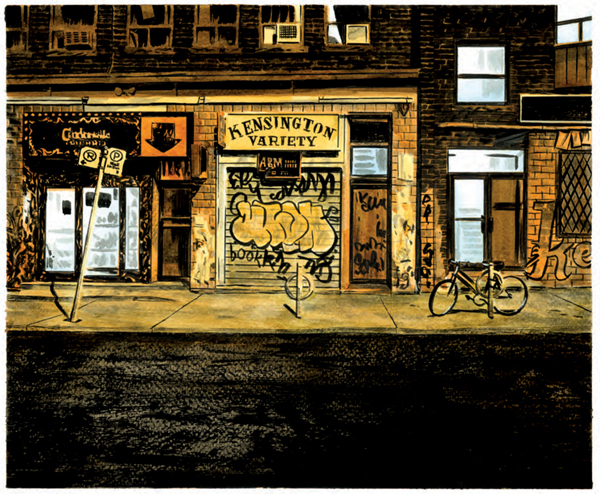 They were two volumes of drawings of downtown Toronto, done in pen and ink, by this one artist. It was just a survey of his time in the city. He would draw the intersection of Yonge and Dundas, which is a very popular intersections here. Which now has concrete towers and movie theaters and crazy sidewalks. Back then, his drawing just had a corner with two buildings and the horse carriages. 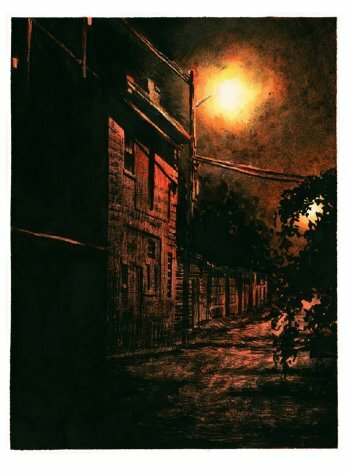 A few years later he did a drawing of a similar location and it had streetcar tracks. He documented the evolution of these things. I was interested in who this guy was. In the book you realize that what he was was an insurance salesman who did these drawings on the side for the calendar he gave to clients. He did them over the course of 20 years or something like that. [laughs] It was great to see. The first volume of drawings you'd go, "Those were nice amateur sketches and pen and ink drawings." They're great documents of what the waterfront looked like with that one pavilion that remains today but the rest is unrecognizable. By the time you get to the middle of the second book, you realize, "Wow, this guy has become a pen and ink master." [laughs] This is the evolution of ten years of drawing that's coming out here; these are great books. I always thought that at some point they were so inspirational I always wanted to document the environment I grew up in with the city, and what the city looks like to me today. You know? So I always had that idea in the back of my mind when I was drawing these books. Certainly when I came up with subjects for things, I was thinking what is it about Toronto do I want to capture? So that was in my mind. SPURGEON: One thing you mention in the text that accompanies the pictures in this book is that there was an element of a drawing exercise in this project for you, that you wanted to become better at drawing landscapes. That's something you weren't comfortable with at one point in your career. The reason was that I was a city kid. When I would see landscape paintings I could relate to them somewhat, but I wouldn't be able to find similar locations in the city to draw. I didn't think of backgrounds or landscapes or drawing the city as something fun because I always equated it to drawing straight lines with a ruler. Like most kids who grew up visually attuned to comic books, I always saw skyscrapers drawn in a John Romita style with Joe Sinnott inks or something. [laughter] They're very clean. I hated doing that. The figures to me had rhythm and organic qualities; I never thought the buildings did. When I became a professional illustrator, one of the things I had to do was shore up my skills and become well-rounded. It's a personal exercise. I would devote time to trying to improve in that department. I realized that to start with what I wanted to do is draw confidently the surroundings I live in and which I was comfortable with. Because I don't have an affinity for drawing a pastoral landscape. [laughs] You know what I mean? I've never lived in that environment, so I can't draw that thing with confidence. When I close my eyes I don't visualize that with any confidence. But a city is something I'm surrounded with constantly. With alleyways and lane ways and how light poles connect up to transformer towers which have extra leads leading down to the basement apartment. I can see that when I close my eyes, you know? So that's the kind of stuff I started drawing, and the more I started drawing that stuff the more I discovered a real love for it the way I love figures. Back then I considered them backgrounds. [laughs] Now when I draw buildings or landscape-type pictures, I often consider the buildings to be the figures in the drawing. SPURGEON: Is there a progressive quality to these drawings? Do you see a difference between the drawings you made in 2006 and the drawings you made last year? CHO: Oh, yeah. Yeah. Definitely. SPURGEON: What would be the nature of something you see that's different now? CHO: If we get technical... 2006, I'd say I'm still getting comfortable with the subject matter and an approach to them. Right? Which at some point I get very comfortable with, and then once I get comfortable with anything I just want to move past it and see if there's something else different. You don't want to be bored. With any kind of personal work I ever do I have a different agenda than say the work I do for clients, which is to their specifications a lot of the time. When it comes to personal work my own interest is to keep absolute fidelity to whatever emotional quality I'm trying to express. If my style or a way of drawing is a hindrance to that, I have to evolve it or change it, find a different way to express myself that will express that emotion. SPURGEON: Two things that strike me about your experiences growing up as I've read about them in interviews. One is that your early childhood -- including your initial experiences drawing -- was spent in Korea, if I'm right. And also that you assimilated yourself to English by reading graphic literature of all kinds when you got to Canada. CHO: Somewhat. I didn't learn to read reading comic books. But they were the thing that I gravitated to immediately. SPURGEON: Do you think your visual imagination or the way you approach the page is different for having those two formative experiences? That's a very different culture you were in, and a very different thing to be taking from the comics and art you were seeing later on. CHO: It's too young. I was what, six? At the age of six, you don't even know artists' names, let alone styles. You know what I mean? [Spurgeon laughs] So I wasn't thinking in that way. I don't think there was an eastern meets western influence from my moving to Canada. I think if anything, my time in Korea was spent developing a love of drawing, as opposed to an approach to drawing. 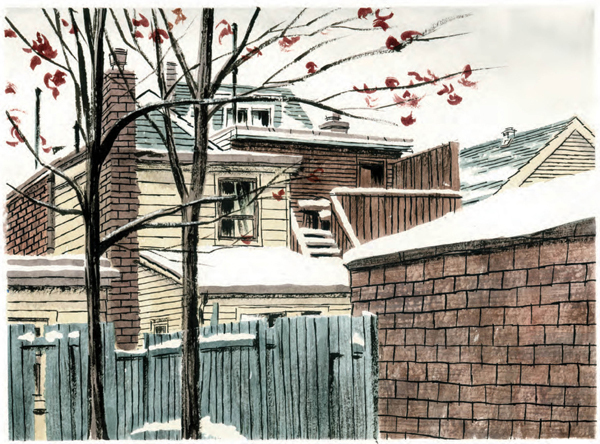 When I came to Canada, I fell in love with what art I was exposed to, which was comic books and cartoons, newspaper comic strips and occasional trips to the art gallery. So my approach was western, because that's what I was indoctrinated with. [laughs] I didn't grow up with like a manga-style pacing in my head for comics pacing, or tropes in my head for how people should be drawn in an anime-style. Or even an affinity for things like Chinese brush painting. Which I do have now. [laughs] This is interesting, because I always go back and rediscover that stuff because it's stuff my Mom likes. SPURGEON: If this project represents a kind of sitting down and working through something, focusing on a certain kind of illustration, a certain way of looking of things, how much do you study still? SPURGEON: Yeah. Do you have that studious approach to art, still? Do you still seek something out and see how someone else does it and then apply that to your work, or is it mostly working through your own interests at this point? CHO: I still absolutely have a hunger to see how the other guy did it. If it comes down to artists. If it comes to expressing anything artistically, I'm always looking for a way to get closer to the page, you know what I mean? What I see in my head, or what I'm feeling, try to put more of that down on paper. That desire doesn't change, but I have a daughter now. [laughter] There's only so many hours in the day. When I was younger I would devote more time to working through my influences. When I started cartooning I remember fastidiously being entranced by Noel Sickles and Frank Robbins and just how they did it. I would look at their stuff and trying to work through their mental process to the point where I could think like them. Similar things happened with Wally Wood. I would do studies and stuff like that. It's the same with painters and other artists in other fields. I went through a big phase where I wanted to paint like Gerhard Richter or James Rosenquist or Alice Katz, even. I think if you're visually attuned at all, when you look at anything visual that you like you're always trying to figure out how they did it or what qualities make that work. I think you're always evolving and growing unless you treat art purely as a vocation that makes you money. SPURGEON: I've read you on Noel Sickles. We used to have the rumor of Sickles unless you really worked to track it down; now we have a grander idea of what Sickles did and when. What is it that you took from Sickles? When I started cartooning... I became an illustrator kind of by accident, just to pay the bills. Then I discovered I really loved it and wanted to do it as a profession. One of the things I loved working in is this cartoony style. I don't draw like other illustrators. My natural style is developed from my love of comic book and cartooning. Sickles was to me the bedrock of how to understand certain aspects of cartooning. Inking... he's the bedrock to me. You can learn how to spot blocks, for example, by looking at Wally Wood. You can learn how to spot blacks by looking at Joe Kubert. You can learn to spot blacks by looking at Kevin Nowlan. Right? But they learned from another guy before them and then they stylized on top of it. You're not going to learn as much if you just study how Kevin Nowlan double-lights something; you might as well look at Wally Wood, then. If you're looking at Wally Wood, you might as well look at Hal Foster. [laughs] You know what I mean? I always find that the closer you get to the bedrock, the more you find information that's in its rawest form, before the stylization. That information you can process on your own, and assimilate it, turn it into yours. You can add your own flair to it without feeling you copied this guy's hatching style of something. Sickles was just the best at that. He was natural. He drew stuff that was completely impressionistic but completely convincing because he understood construction. He understood how an object comes together and how it works in 3-D so you can light it. He knew how to get across spontaneous effects, and knew what was important. He didn't even cartoon for that long. It was like three years. And the period he's really known for, that black and white stuff, it's like six months. The other times he's trying to quill stuff and crazy duotone board stuff. That guy was relentlessly intelligent. He's not as good a storyteller as some of the other guys. The guy I always looked at for storytelling is Roy Crane, personally, but Frank Robbins and Milton Caniff were amazing as well. That guy... I don't know. When I was trying to figure out, I was a line art guy. I was interested in a very clean, inked line. When I saw Sickles the light went off in my head that there's another way. SPURGEON: I think a lot of people I know, when they think of your stuff, they think of this really striking superhero pin-up work that you've done over the last few years. These very attractive, single-color, sometimes in gouache -- it's pronounced "gwash," right? I don't think I've ever said that word out loud before. CHO: It's "gwash." Poster paints. SPURGEON: I think of those single images when I think of you, too. Am I right in thinking that was a big sideline for your illustration work for a while? I worked in children's comics for years, and it was very safe and tame. When I quit that kind of stuff, I remember talking to some friends of mine that wrote and drew superhero comics and such. "Hey, I'm just going to show you some samples of action stuff, and you can tell me whether or not it's up to snuff." Then they would take a look at it and go, "Oh my God, this is the safest jump I've ever seen. There's no immediacy or danger here. He looks like he's jumping one inch and he's smiling." [laughter] So I was like, "Okay, I have to take a second pass at this." I'd come back and they'd go, "Okay, this is really charming, but he's 15 and he has a scrawny neck and he could never deliver that punch." [Spurgeon laughs] Eventually they were, "Okay, you got something here. That's convincing; that looks like a decent Iron Man." So part of it was that. Part of it was that I would work through assignments that were, let's say, less than enjoyable, because they were driven by large committees and involved multiple revisions on a topic that was dull in the first place. At the end of the night I would be like, "Okay, I think I'm going to paint something for myself." And it would be the Hulk or something. I would take them to shows, and sell the original paintings. People wanted them, so I decided to make them prints. SPURGEON: Other than the fact that people have great affection for those characters -- you do, too -- is there anything to them visually that you enjoy? Is there something that makes a picture like this work other than the narrative authenticity you just described? SPURGEON: When you doing those kinds of characters, is what appeals to people the affection they have for the characters, or are they uniquely visually appealing in certain ways as well? CHO: I think it's all of what you're saying. I have a childhood affection for certain characters and certain stories. My favorite superhero as a kid was Spider-Man, because of Steve Ditko. That run is in my opinion the greatest superhero comics ever. So when I draw Spider-Man as an adult, I draw it with a lot of joy, because I can remember when I couldn't draw Spider-Man as a kid. [laughter] I was frustrated when I couldn't draw him. When I draw him I try to draw the best Spider-Man I can possibly draw. When I get it, I fulfill the goal of the eight-year-old me that wanted to draw like Ditko. I have a lot of that, I'm not jaded to that in any way. The other part of the thing is I have an affection for the stories and the characters of the past in terms of the creators that created them. 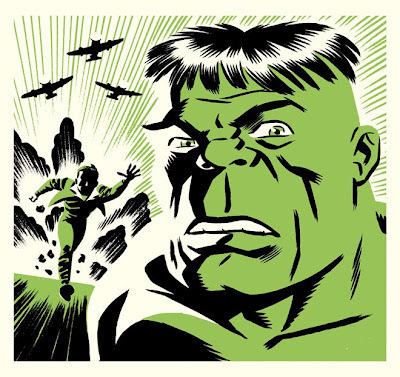 A lot of the characters I draw are Jack Kirby types of characters. I have a real affinity for the work and I learn from the guy. All that stuff I was telling you earlier about my friend telling me that punch doesn't work or that jump is so tame, it's all solved by me going more Kirby on it. [laughter] You know? You put a bit more Kirby into it, it works. The rest of it is just window-dressing on top of the Kirby. SPURGEON: You switch media a bit in the alley portraits. Was that just wanting to learn the tools in question, or is it something you're seeing form a scene that makes you, say, want to work in markers? CHO: The gouache is the go-to one. It's the one that has the most flexibility for my approach. I'm most comfortable working in gouache. I work in markers when I want to be fast. Gouache takes time to draw in; markers never do. If it's a sketching thing, it's markers, but the look is never as good. The watercolor stuff that I did, I have absolutely no skill at watercolors, zero, so I only used them begrudgingly because I knew that certain effects require watercolor. I had to do like a soft sky, which is hard for me to do in gouache. Most of the immediate choices were just as a result of the demands of the drawing. SPURGEON: The pull-out drawing is pretty spectacular: the curved street, College Street. CHO: The, big wide one. SPURGEON: This was something that wasn't part of the series, but was part of a different exhibition. 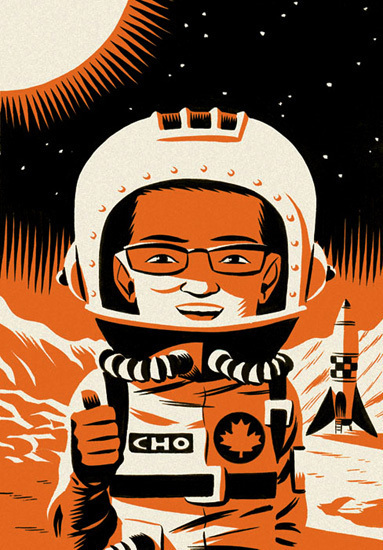 CHO: That was done for an exhibition in Toronto at the Harbourfront, which is our waterfront. There's a nice public gallery there. They were putting on a small show of cartoonists drawing pictures of their neighborhoods. They could interpret that any way they wanted, so it wasn't literal. 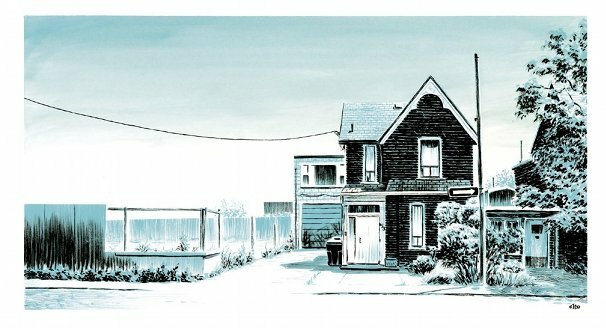 They invited myself, Jeff Lemire, Zack Worton, Willow Dawson and Hyein Lee, who is another cartoonist in Toronto. They asked us all to submit one piece. Before I did it -- they wanted it custom-done for the show rather than something that existed already -- I went to the space to figure out the dimensions of the space and draw something to fit. It ended up being three-and-a-half feet wide. Impossible to paint on the drafting table. It's like an easel-painting size, but it was on paper, so there wasn't any real way to do it. I had to work on a light box because I always work on light boxes when I paint. It took four days. I was really happy with it. I did it in April, so it was either the day before the day right after my birthday when I finished it. I remember thinking this was a good summation of where I was at my age. That's something I'm always looking for in my art, where I am and how much more I have to do. SPURGEON: You mentioned a light box. Were there photos taken or studies done...? CHO: That one is definitely photo-based. There's no way I could sketch that much, and it wouldn't work anyway. I'd get bogged down on the little details. The nighttime ones for example, I went around in the summer time with a friend of mine, Alex Hoffman. I lugged a tripod; he carried a flask. We went around all through the city at 4 AM and took photos. I can't sketch at night. The same with the winter ones. Some of the spring ones were done on the spot in terms of sketches and detail sketches of certain things like how a satellite dish connects. Things like that. It's all observations and learning for me, too. Then they were finished in the studio. All of them were finished in the studio, but some of them were based on photos. SPURGEON: Why is that view of College a favorite? CHO: That view of College? It bends! It's got a beautiful bend in it. SPURGEON: That's visually appealing to you? CHO: That bend is really nice. Also I've loved that view from the first time I rode that streetcar and saw that view. It's in Little Italy, so it's a neighborhood. Every storefront there, they're all neighborhood shops. There's not a Club Monaco or a Gap among them. There's a movie theatre there, the Royal Movie Theatre, which is a great movie theatre that's been there for years. When it was going under, it was bought out by a film company that decided to just keep it and play movies downstairs, the same kind of programming from the previous owners. It has that indie feeling I really love about Toronto. SPURGEON: Another drawing I thought attractive is late in the book when you talked about how a particular view provided nearly unbroken access to the horizon. SPURGEON: What struck me about it is that you depict a lot of that particular horizon before breaking it with other visual elements. All of your vertical elements are placed on one side of the drawing. It made me realize how many of your compositions depend on hard verticals. Are you attracted to start and stops with the eye? Where does your eye go when you look at these pictures? When my wife laid it out -- she was the designer on the book -- she cropped some of the photos and thought it would get past me. And I would say, "Did you crop a quarter inch off of the edge of this thing? Because this drawing doesn't work any more." [laughs] She would say, "I thought you wouldn't catch that." It's what I could control in that scene. I'm not going to rebuild that fence or tell them to tear down that house. The composition I often think about in terms of tilted verticals and horizontals, without diagonals. There's an art-school adage that diagonals create energy whereas horizontals create stability and verticals project power. Little, crooked amounts of those things make an organic urban scene. SPURGEON: There is a lot of strength and stability in these pieces of art. CHO: When I look at that book, it's funny, because I look at those paintings and I often think that the telephone poles are the people. They're the figures in a lot of ways. They're ever-present, and they're all different in their slanting and the way they've been hacked out and so forth. SPURGEON: You mentioned another book you might do with Chris, and we talked in Seattle about other work you might have planned. Can we talk about that stuff in general terms? SPURGEON: Are we going to see a big, long graphic novel from you at some point? CHO: I'm working on it. I actually have stories written and drawn for it. It has to be completed and then we're going to try and find an American publisher. The problem is that when I started this project and started gathering resources to pitch it, it was the absolute worst time in publishing. It was a couple of years ago, during that big crash. The web site I visited the most that year was Magazine Death Pool. [laughter] It tracked everything that was going under in publishing. It was like watching a casualty list. It was horrible! And seeing what happened with book publishers the same way, it was the absolutely worst time to pitch a graphic novel from a first-time graphic novelist. So I thought the best thing would be to take it back and finish up a large chunk of it and hopefully it will be easier to sell, give people a better idea of what it is I'm trying to do with this project. In the meantime, I constantly work on small comics projects here and there. Last year I had a story in the Best American Comics anthology, and I did a webcomic for a while that had a monthly short story. Unfortunately, my comics output this year has been down to two advertising-type projects. I did a book report-type piece on a Jean Genet book that was a favorite of mine for literary web site for Open Book: Toronto, which is a month celebrating reading festivals in Toronto. SPURGEON: That was a striking piece. Is that where the ambition is? All things being equal, is that where you'd like to be in the next few years, doing these bigger comics projects with the small ones in-between? CHO: What I want to do is the plan I've had for the last three or four years, only I'm really slow. [laughter] My first love is comics. When I was in my twenties, I set out trying to make a career in comics, and found out I couldn't draw a lick. [laughs] I realized that what I had to do. In order to draw the stories I wanted to draw, I had to learn to draw much better and figure out how to express the things I wanted to express on paper. Like I couldn't do lighting, for example. So I couldn't generate atmosphere in a drawing. The only way I could do that is distorted figures, and I wasn't that kind of artist. So I held off on that for a long while. But these days, I really do want to do more comics work, and ideally it would be work I could write and draw myself. I have no leanings to be, I don't know, Proust or something like that. My thing is I like all kinds of comics. I like superhero stuff. I love indie comics. I'm not afraid to work in either. It's kind of weird, because when I was growing up there was a very big schism between the two groups, right? Like there was the indie sort of Fantagraphics crowd and there was a superhero audience and the closest they might meet is Alan Moore. Even though I remember that era, I'm from a generation that draws from all of it. But I don't have a desire to make a mash-up, where everything is all blended in together. I like drawing superheroes... two days out of the week. When I draw superheroes, I draw them without irony. I'm not trying to draw fey, little, indie superheroes, poking fun of things. [Spurgeon laughs] I'm drawing full-out superheroes with a love of superheroes. But if I did that seven days a week, I'd be withering away another part of me that wants to express itself, which wants to express other topics rather than more all-ages adventure stories. I want to do something that's a little intimate, and tells a different type of story. If I only did that kind of storytelling, graphic novels about people that work in offices, I would be killing off a side of me that just said, "Don't you want to draw some superheroes fighting some bad guys, a cool story involving robots?" Because sometimes you need that. I love action movies, but I can't watch Michael Bay movies every day. I can watch one of those a month, maybe. SPURGEON: The perceived audience for this new work, the alleyways book: do you think it can work on that audience the way the older books you once saw and were inspired by worked on you? Does it have that snapshot quality? CHO: Oh, I have no idea. I find that things like the perceived view of a book, the perception of the book, it's not decided by the people that created the book. It's often decided by marketing. I know what my intent was. I know that the pictures for me, the ones that I put in the book, were successful to me because they contained whatever I could pull out of my head and put down on paper accurately. There's a painter I really liked in college, Agnes Martin, who would talk about how 99 percent of her painting was a failure... but there was that one percent that came to life -- one percent that she managed to pull out of the ether and put down on canvas. And that's what made the painting a success. I often think that way of my own work. If I can transfer the attachment I have, or the particular fascination I have, for this place and convey just a bit of that properly on paper, and it works for me, then hopefully it works for somebody else. 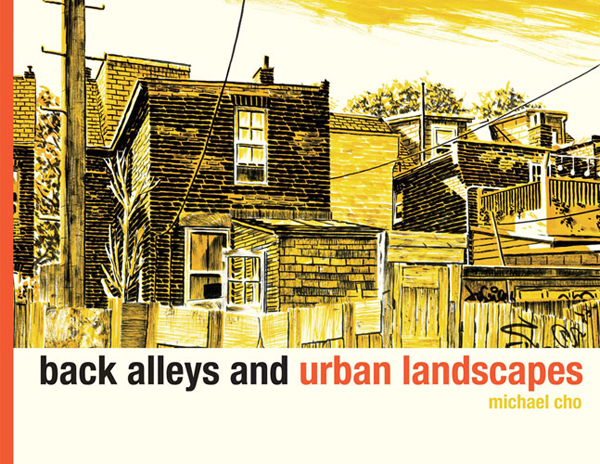 * Back Alleys And Urban Landscapes, Michael Cho, Drawn And Quarterly, softcover, 80 pages, 9781770460805, May 2012, $19.95.